All social media mentions of the keywords you monitor, keywords relevant to your business, marketing, or competitors can be identified on the world’s map. That includes social media mentions from Twitter and Instagram. Location is available for Trial, Professional Premium and Professional Max pricing plans. Location is a filter. Just like other filters inside Brand24, it can be found at the right-hand side of the panel – it’s called Filter by location. 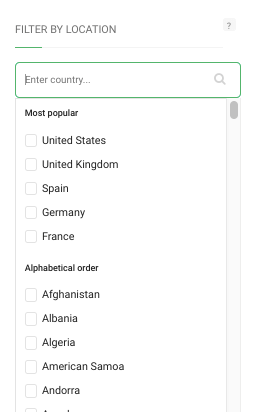 In there, you simply enter country names and tick the boxes to filter the countries you want. Mentions from selected countries will appear in the panel. 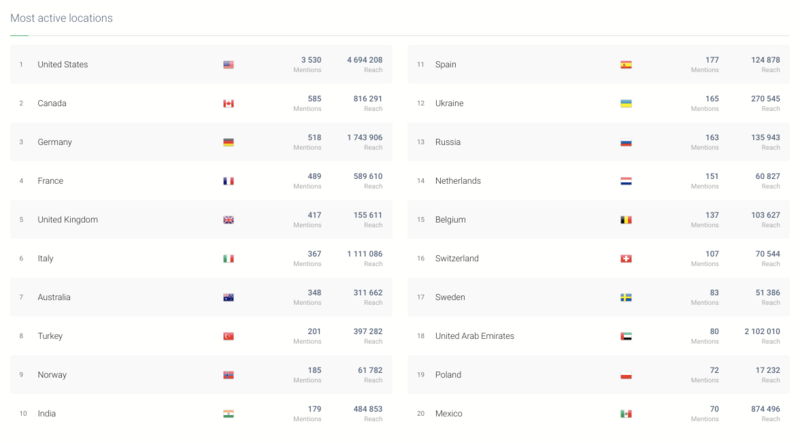 The analytics connected to Location can be found in the Analysis Tab and the Summary Tab – they will show 20 countries that generated the biggest number of mentions. Locations data is also available for export – PDF Reports, Excel, or Infographic.